Taking time out from the normal day to day routine (although our days are far from routine!) is an opportunity to open your mind to fresh thinking and new ideas. 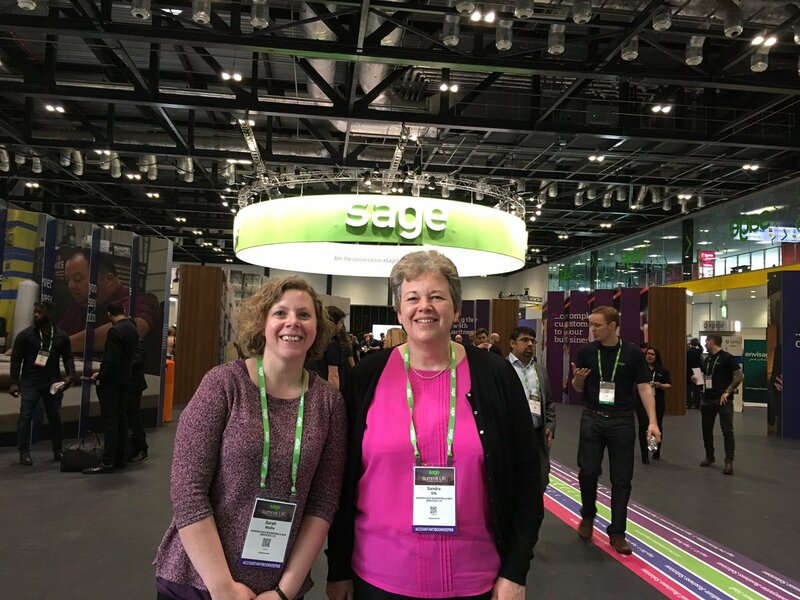 Last week Sarah and I attended Sage Summit in London - a two day conference showcasing Sage products and a chance for Sage to share its recent developments and enhancements and their plans for the next 12 months. Deborah Meaden and Martha Lane Fox were two inspiring speakers in the Keynote which was followed by a choice of at least six different sessions to choose from every hour as well as stands demonstrating Sage software and partner software. Each session gave us an insight into different software which could be valuable to our clients as well as giving us knowledge of how the software we do use has been enhanced. The sessions certainly gave us inspiration to go home with. What surprised us was how many products Sage has and how it is using the cloud to provide easier access to traditional "desktop" software as well as some useful reporting. It has cloud based software too - Sage One - which is great for smaller businesses and is in the marketplace alongside Xero and Quickbooks Online (QBO). Sage 50 Accounts has been around for 30 years and most bookkeepers and accountants know it pretty well. We like its invoicing module, its batch supplier invoicing and its straightforward reconciliation. But most of all we like its audit trail which tells us so much. Now Sage 50 is taking on more of the functions of cloud based software with bank feeds and the ability to add an invoice and the date it was paid at the same time in the same window. Attending Sage Summit reminded us that Sage 50 Accounts is still a good software and it still suits many of our clients. Whilst other bookkeepers or accountants might encourage their clients to use a particular software we will always identify the needs our client has and match those needs with the most appropriate software. Sage Summit inspired us to evaluate each of the accounts softwares we use regularly - Sage 50 Accounts, Sage One, Xero and Quickbooks Online and identify their pros and cons (they all have things we really like and things we really don't!). That will then help us to match the business with the most suitable product for their needs - after all every business has different needs and different reporting expectations. Sage Accounts has developed a lot since I first started using it but the developments outlined at Sage Summit came as quite a surprise. Pegg is a chatbot which lives in your mobile and acts as your admin assistant. It will photograph your receipts and answer your burning questions such as "How much am I owed?" Appealing to people who are always on the move. Sage Capture, Sage 50C and Intelligence Reporting are new products we will be looking at in more detail to see how these can help our clients with their businesses. It is not always easy to find the time to identify and research new products which are appropriate for or enhance client services but certainly a day away from routine in an environment devoted to what we do is a perfect opportunity to do just that.